If you’re hosting Thanksgiving dinner this year or if you’re planning to travel some distance to spend the holiday with your family, there’s bound to be a lot on your mind. Planning, budgeting, shopping, booking tickets, packing and what not. At least, there’s one thing that you can do pretty much effortlessly – send free Thanksgiving ecards to your friends and family. That’s right. It won’t take a minute. And if you follow our advice, you can be sure that all your loved ones will receive a free ecard from you on Thanksgiving. So you can eliminate at least one last minute task from your ‘to do’ list. Have you ever thought about Thanksgiving from a Turkey’s point of view? Or what the perfect Thanksgiving card for your husband (or wife) might say? How about a Thanksgiving card for the shopaholic who can’t wait to start Christmas shopping on black Friday? If your friends and family are a diverse bunch like mine, it’s always a challenge find the perfect wish and greeting card for everybody. You may have to spend hours browsing through cards, locating the ones with the right words and sentiments that convey your message. Why spend hours in the greeting card aisle when you can spend just a few minutes at your desk (or bed or couch?) sending beautifully animated Thanksgiving ecards? Simply spend a few minutes browsing our selection to see what I mean. Whether you prefer a traditional, pilgrim themed ecard or a more humorous one, you’ll see that we have an ecard just for you. Our free Thanksgiving ecards section includes cards that children can send parents or grandparents and vice versa, ecards for spouses, friends and relatives. Free, Convenient, Assured, On-time Delivery! The best part of it all is not just that it’s free. It’s that you can send as many ecards at your convenience, any time you want, to as many people as you want, as many times as you want. And you can forget worrying about your card getting lost in the mail or being delivered late. Send now, open later – a great ecard feature! When it comes to ecards, my favorite feature is the option that lets you send your ecard on a chosen date. I love this because it gives me the freedom and flexibility to greet my friends and family when I find it convenient. I usually don’t forget a lot of dates. I remember most birthdays, anniversaries and special occasions without having to set event reminders or using a calendar. But, often, what happens is, on the day that somebody’s birthday or anniversary falls, I end up being swamped with work or waiting with an impatient and sick 3 year old at a doctor’s office or buried in something else, so much so that I sometimes end up not finding the few minutes it takes to send an ecard or make a phone call. So at times, I end up not wishing my friends and family on special occasions, even though I keep reminding myself that I should. So, this ‘Send on a chosen date’ feature, to me, is a terrific add-on to ecards. Now, I simply set aside a time during the week on a day when I’m not too busy or on weekends and send free ecards to all the people whose special days are coming up. I pick the date the ecard needs to be sent and that’s it. Never again do I have to miss sending someone a free ecard just because I’m too busy or don’t have access to the internet. While this feature is great for birthdays and anniversaries, I find it very useful for holidays as well. The problem with holidays is that there is always so much going on that it’s not always possible to do everything you want to. Besides, holidays are times when you have to wish several people on the same day, which could take up a lot of your time, amidst all the frenzy already happening around you. Take Thanksgiving, Diwali, Christmas or New Year’s for example. Most of us want to wish at least a dozen people on these holidays. Parents, siblings, cousins, friends, colleagues…the list could be quite long for some people. So, if you were to sit down to send them all ecards on the holiday or the night before, it would take you forever. Besides, there’s always the chance that you might accidentally leave out someone in a hurry. So, what I do, is a few days before the holiday, I start sending out the ecards. I set aside a few minutes every day to send about 5 or 6 ecards and then check those names off my list. By the time the actual date arrives, I’ve covered all the people on my list and can be sure that they will all find an ecard from me in their inbox. This method gives me more time to pick and choose the ecards I want to send, to personalize each ecard with a message and almost always gives me some last minute grace time to send free ecards to a few people I may have missed. Send your free Thanksgiving Ecards today…You will be thankful you did! Why not try this for Thanksgiving? It’s still a few weeks away and you have time on your hands. Start today. Make a list of all the people you want to wish a Happy Thanksgiving. Everyday, send out ecards to about five of them (more or less depending on how many people you want to send ecards to) This way, you can be assured that all your loved ones will receive an ecard from you on the day of thanks. And just like that, by spending a few minutes each day, you would have conveyed your love and gratitude to all the special people in your life. And on Thanksgiving Day, you won’t have to furiously type away hurried messages, sending ecards to mis-spelt email ids. Saying Thank you doesn’t get any easier. So, say Happy Thanksgiving to your family and friends with our beautiful selection of free ecards. If our variety makes it difficult for you to pick, go ahead and pick as many as you want. You still have time to send all the free ecards you want to, remember? Come November and the holiday season mood sets in. Even though Christmas is two months away and Thanksgiving is four weeks away, it still feels like they’re around the corner. Do you sometimes get the feeling that your third grader knows more about Thanksgiving than you? Relax. You’re not alone. Refresh your memory with these facts about the origin of Thanksgiving and you could ace that third grade quiz! 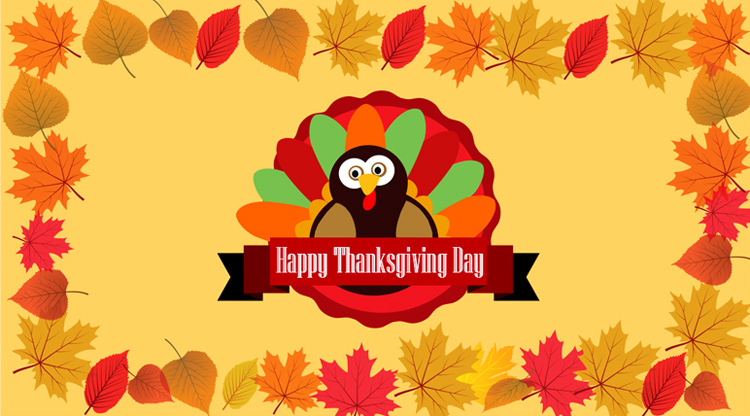 · Thanksgiving, as we know it was first celebrated by the Plymouth pilgrims who had arrived on the Mayflower. However, long before the pilgrims arrived, Native American tribes practiced the custom of celebrating harvest with a feast. · Only about half the pilgrims survived and they expressed their gratitude with a thanksgiving feast after the first harvest was completed that fall. · The first Thanksgiving was celebrated in 1621, in Plymouth, Massachusetts. · The pilgrims invited the neighboring Wampanoag Indians to the feast which lasted three days. · The harvest meal included deer and wild fowl and not pumpkin pie or turkey. · The pilgrims did not use forks. They used knives, spoons and their fingers. · In 1623, during a drought, the pilgrims had allocated a day for fasting and prayer, but rains came during the prayers and turned it into a day of thanksgiving. · The Continental Congress suggested a yearly day of thanksgiving during the American Revolution. · In 1863, President Abraham Lincoln appointed the last Thursday of November as national thanksgiving day. · Since 1939, Thanksgiving is celebrated on the fourth Thursday of November. What started as a day of thanks has become a long weekend almost everyone looks forward to for different reasons. The next post will highlight some of the modern day Thanksgiving traditions and the different ways the holiday is celebrated.